Things were quiet around CrowClan, SilenceStar had recently offered shelter to a newly made rogue, one that was unsure on how to hunt and fight for himself. SilenceStar was unsure too.. Unsure of what had become of the other clans since the great famine that sent sickness raging through each clan, killing and weakening cats, some of the warriors left the forests in fear that they to would parish. SilenceStar had decided to remain true to the clan ways, going to the Moonstone she received her nine lives and was accepted as the true leader of crowclan.. Deep in thought she moved alone along the uneven forest ground, her tail trailing along behind her. Nearing the border between SquirrelClan and CrowClan she slowed her pace and glanced across into their territory.. I wonder.. The large tabby padded through the territory. Green eyes surveying everything in sight. He was alone on his trip, as there weren't many cats left in SquirrelClan. He hoped soon that would change. He shifted his route as he went to the border with Crowclan, stopping to mark scents every once in a while. He stopped to look over to Crowclan territory. Wondering if they had such few cats as they did. SilenceStar was lost in thought, her mind tried grasping onto what they all once had.. They were peaceful and content. Flicking her tail back and forth she stopped at the border, placing her paws on the invisible line that separated the two territories. Gazing across she seemed to fall deeper into thought. Darkheart froze suddenly. Ears perked up.Was that what I thought it was? He was sure he heard the voice of another cat. He sniffed the air and found himself taking in the scent of another cat. The tom moved his way to the sound. "Who goes there?," He meowed deeply. Hearing the voice of the other cat caused her thoughts to be thrown away, her eyes instantly became guarded, Who goes there the voice said, it wasn't a familiar voice, the territory could very well be vacant and have rogues and loners crawling through it like termites in an old tree trunk. "Show yourself and I will answer accordingly." She replied to the voice, as her gaze scanned the grounds before her, it could be a house-cat.. Or maybe she was hearing things and a squirrel made a noise... But that wasn't it, she could smell cat, it was a tom though his scent was still muffled, it could be Squirrelclan and it could not be..
Darkheart narrowed his eyes slightly as he came into view. The tom made sure to stand tall, showing off the large built he had. "I will ask again. Who goes there?" He looked over the white cat in front of him. SilenceStar only smiled at the toms request, dipping her head she flicked the tip of her tail. 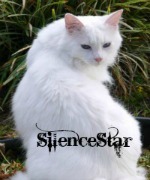 "I go by the name SilenceStar, I am the leader of CrowClan. May I ask whom you are and if you are with SquirrelClan?" The small in stature white pelted she-cat planted her haunches on the ground and curled her tail laying them neatly over her dainty paws. Darkheat studied the cat in front of him.So this is the clan leader of Crowclan. He waited a moment before responding. "I am Darkheart. I am a Squirrelclan warrior." He took his eyes off her to look behind her, making sure she was alone. She watched the tom look past her, his action causing her to snort with annoyance. "I'm alone, besides why would I send an attack on you clan? We are all suffering" SilenceStar twitched her whiskers. "So don't worry about a cat darting out from the undergrowth." She heaved a sigh and fluffed up her pelt as she gazed at him, "anyway, it's nice to meet you DarkHeart"
Darkheat let out a small snot of his own. "And how am I suppose to know that? I've heard no word from any other clans. Who knows what all survived." He returned her glaze as he finally sat down, making sure to keep on alert though. "And Its nice to meet you as well Silencesta," He said with a small dip of his head. Darkheat sat in silence for a moment, thinking of how to word his respone to her question. "We are.. Few.. But we are strong." He didn't want to give much information out. In fear of making the clan sound weak. As long as he breathed, he would keep the clan strong. » Crickets: friend or foe?